CLARO will host an Urban Orienteering (Regional) Event at Knaresborough on Sunday 27th May 2018. A newly updated map at 1:4,000 has been prepared with additional parts of the town centre and Conyngham Hall that have not been used before. There are excellent opportunities for off-road junior courses. This event has a castle, river, railway, bridges, ginnels, steps….. Do the double with York City Race the next day. This event is part of the Yorkshire Urban League. A PDF version of these details will be available for download once they are final. Henshaws Arts & Crafts Centre, 50 Bond End, Knaresborough. ENTRIES: Entry on the day only (EOD). To comply with the new General Data Protection Regulation, by entering this event you agree that we may publish your Personal Information as part of the results of the Event and may pass such information to the governing body or any affiliated organisation for the purpose of insurance or for publishing results either for the event alone or combined with or compared to other events. Results may include (but not be limited to) name, any club affiliation, race times and age group. ELECTRONIC PUNCHING: SPORTident (SI) electronic punching will be used for all courses. All versions of SI card (dibber) can be used. Controls will NOT be enabled for touch-free punching, but competitors can still manually punch with the newer SIAC cards. Hire dibbers will be available. Conyngham Hall car park is 150 m from Registration. The route from this Car Park to Registration will be taped. By Car. From Harrogate, take the A59 into Knaresborough and park in the Public Car Park at Conyngham Hall. From York, follow the A59 into and through Knaresborough Town Centre, direction Harrogate and park in the Public Car Park at Conyngham Hall. Conyngham Hall car park is 150 m from Registration. The route from this Car Park to Registration will be taped. By Train. The event is near Knaresborough Railway Station (8 mins walk). First train from York is 10.45 am arriving 11.11 am. First train from Leeds is 9.05 am arriving 9.52 am. By Bus. The 1A Bus runs from Harrogate Bus Station to Knaresborough Bus Station (15 mins from Registration) every hour from 10.15 am. Journey time is 20 minutes. From Leeds City Bus Station to Harrogate there is the No 36 which runs from 8.15 am every half hour (except for a break between 9.15 and 9.50 am) with a journey time of about 50 minutes. There are no buses from York on Sundays. REGISTRATION / DOWNLOAD: Henshaws Arts & Crafts Centre, 50 Bond End, Knaresborough, HG5 9AL. TERRAIN: Knaresborough is a medieval town dating back to pre-Norman times. 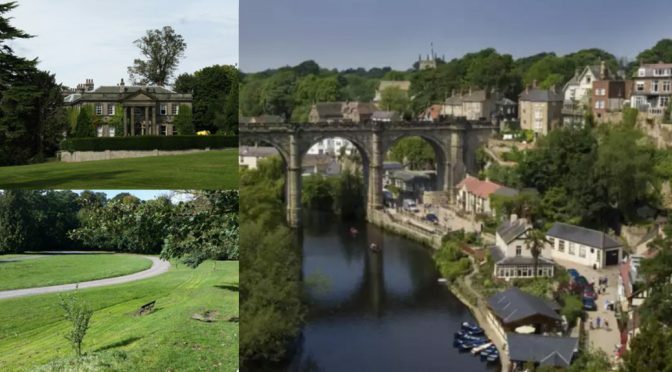 It sits on a gorge of the River Nidd and comprises not only typical urban features, but also narrow winding streets and alleyways, together with steep climbs up from the Nidd. Two new areas have been added to the 2015 Knaresborough Urban map for this event; – firstly an area of Town Centre to the west of the Railway Station and secondly Conyngham Hall, an area of parkland. These interesting additions have allowed the creation of original courses. Also, the use of the 1:4,000 scale for the first time means maximum use can be made of the excellent Castle, River and Parks areas. Courses A-G will start in the town and use all areas before returning to the Finish in Conyngham Hall via a timed-out road crossing. For the youngest Juniors, Course H will be within Conyngham Hall and the riverside area. STARTS: There will be two Starts. The Start for Courses A-G will be to the East of the A59. It will be 400m from Registration and 100m from the Conyngham Hall Car Park. The route will be taped and involve crossing the A59 by pedestrian crossing. The Start for Course H will be adjacent to Henshaws Art & Craft Centre. Note there will be a shorter start window for this course due to anticipated low competitor numbers. Loose Control Descriptions will be available at each Start. COURSES: There will be eight courses, covering the normal Urban League classes. All course details are provisional and subject to final controlling. Distances and climbs to follow. You may enter any course of your choice except for those under 16 who may only enter courses G or H and those under 12 who may only enter course H due to the need to avoid road crossings. You should enter the course for your age class to count in the leagues. FACILITIES: Henshaws Arts & Crafts Centre has Toilet Facilities for its visitors which will be available to us. It also possesses a fine Café. There will be a Craft Fair on at the Centre on the day. There are public toilets at Conyngham Hall Car Park. There are also extensive facilities in Knaresborough, including the Castle, and boating on the river. DOGS: No dogs on courses please, although they are accepted on a lead at Registration. SAFETY: A comprehensive risk assessment will be carried out by the organiser, but participants take part at their own risk and are responsible for their own safety during the event. This is an Urban event and Courses A-G will, in part, be on public highways, some of of which can be very busy, particularly in Knaresborough Town Centre. Competitors must exercise due care and consideration to all other road users and members of the public and should comply with the Highway Code when crossing roads. The longer courses reach into the old Knaresborough Town Centre and care should be exercised in the use of stone steps which can be slippery when wet. If travelling alone, please leave your keys at registration. All competitors who start must report to download even if they retire. Please dress appropriately for the time of year and specific weather on the day. In the unlikely event of cancellation, details will be posted on this website – www.claro-orienteering.org.uk. Information can also be obtained by phoning the organiser. If you have a medical condition that first aiders should know about in an emergency, please contact the organiser with details before the event, or fill in a form at registration. These details will only be used for the purposes of this event and can be collected or will otherwise be deleted/destroyed afterwards. RESULTS: These will be posted on this website, www.claro-orienteering.org.uk. PHOTOGRAPHY: In accordance with current British Orienteering O-Safe Safeguarding Policy, participants should be aware that there will be no specific ban on photography (including headcams) at this event. Anyone partaking in photography should be aware of and comply with the current O-Safe policy, which is available here.